Come see us at the 2017 Fredericksburg Home and Garden show. We will be in booth 417. We would like to wish everybody a happy and prosperous 2017. Make time to get amazing window treatments to decorate and enhance your rooms for 2017. Please give us a call for a free in home estimate. We look forward to hearing from you. 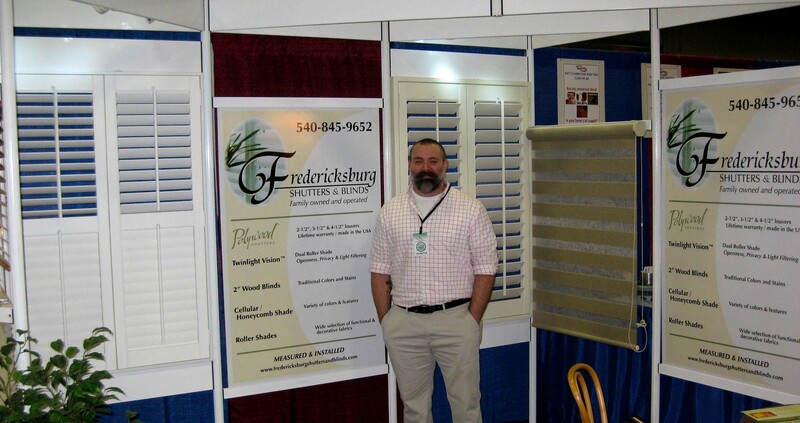 Fredericksburg Shutters & Blinds is a family owned local business. We have lived in and around Spotsylvania most of our lives. Our family has been involved in the window treatment business both wholesale and retail for 30 years. We have been selling and installing shutters and blinds for about seven years. We offer a complete turn-key package on all custom shutters and window treatments. We provide free quotes in your own home. We come to your home with color selections, samples and products for you to make your selection. Lighting and room colors all play a role in the decision making process and help to really find out what products work and look good. We also provide professional installation. The complete "in home" shopping experience from start to finish. Custom Polywood Shutters have an elegant appearance and are built solid. Polywood Shutters add style and value to your home. They come in three colors; white, snow, off white and in three different louver sizes – 2.5”, 3.5” and 4.5”. Wood Shutters are a beautiful addition to any home. They are constructed from sustainable woods like Basswood. Wood Shutters will add value and beauty to your home. Twinlight shades are a beautiful and new innovative product. It combines the beauty of a roller and sheer shade with the function of a horizontal blind. Twinlight comes in a variety of beautiful colors and fabrics. Privacy, light filtering and beauty -- this shade does it all. Cellular shades provide superior insulation and noise reduction at an affordable cost. They also add beauty to your windows with an impressive variety of designs & colors, fabric color and pleat options. Cellular shades also come with a wide selection of operating options from motorized to cordless. Wood blinds provide a timeless look with the warmth and beauty of finely crafted wood. Various options include different valance designs and appearances as well as decorative cloth tape to provide accent color that coordinate with your room décor. Available in a wide range of stains and paints.